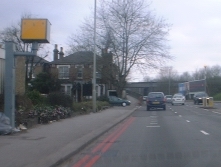 Speed cameras, or Gatsos as they are also known, are found all along the A406. They are easily identified by their bright yellow casing, the lines marked on the road, and by the traffic slowing down for them. Speed limits on the A406 vary from 30 to 50 miles per hour, so be careful as some Gatsos are set very close to the limit. A list of "safety cameras" on the A406, as provided by London Transport, is summarised here. These people operate at several junctions along the North Circular and are almost always groups of immigrants; usually the women do the squeegees while the men sell flowers. 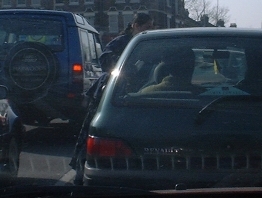 The squeegee merchants use small bottles of water and will often leave your windscreen worse than when they started. If you don't pay, they will sprawl on the bonnet to stop you moving, pull your door open, or squirt dirty water back onto your car. Don't let them near! These people advertise "10 roses £3 20 roses £5". However, you can get nicer, longer-lived flowers from a supermarket, of which there are many along the A406. Petrol stations also sell flowers. 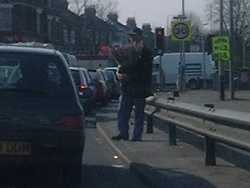 People using crutches have been seen begging from car to car at junctions on the North Circular, however they are far more rare than flower sellers and squeegee merchants.